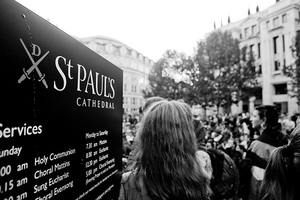 In a move "unprecedented in modern times", St Paul's has been forced to close due to health and safety concerns arising from the Occupy London protest camp on its doorstep. The Dean of St Paul's has written an open letter explaining the move, expressing delight that the protest has been peaceful and emphasising that there has been dialogue with the protestors since the protest started last weekend. simply not possible to fulfil our day to day obligations to worshippers, visitors and pilgrims in current circumstances. Acknowledging shared values and concerns about the creation of a more just world the Dean goes on to ask the protestors to withdraw from the camp to enable St Paul's to reopen as soon as possible. However, a one week anniversary public address and programme is planned for Saturday. Reaction on the Occupy the London Stock Exchange Facebook group is so far pretty mixed.